I was playing with audacious's effect setting called "Bauer Stereophonic-to-Binaural (BS2B)". it's a dsp which will gives you crossfeed effect (more info: https://en.wikipedia.org/wiki/Crossfeed). it's a quite nice sound effect since gives you more natural sound and less fatigue on long term usage, and have been my solely reason why I can't use other music player. then, suddenly I realize that audacious is simply using bs2b library in linux. it means that we actually can use it globally for every music player (and even video player) in our system. this tutorial is about how to implement crossfeed effect globally by using ladspa plugin and pulseaudio. why pulseaudio? because it's the easiest method to implement it. you can also do it on ALSA just like described in this post https://takla.wordpress.com/tag/bs2b/ but as you see, it's quite complicated. compared to that using pulseaudio is lot easier. pulseaudio alos have another benefit where we could choose "what" and "when" will use the crossfeed effect. next, load the ladspa modules. next, open pavucontrol, clik playback tab. if you see LADSPA stream on it, it means the modules have been succesfully loaded. however, it's not used by default. in order to use it you need to change the output line of your music player. simply open your music player then change the output line to LADSPA. the bs2b plugin can be controlled by changing the "control" value. Huh, that's amazing. Thanks a bunch, kurotsugi! For headphones using crossfeed can be very helpful, relieving or less ear straining. Hard panning can be quite annoying in those conditions -for regular speakers I'm totally fine with it-. It's a nice tool to have in the stash on occasions for a more comfortable listening experience. I haven't went through all the info and links, but, this setup can be used with any other ladspa plugin. A nice way to implement a systemwide equalizer... or a flanger! This thread might be renamed as Enabling ladspa plugins systemwide. PS, Yup, it's described in the Takla's link you provided. For non pulseaudio systems like mine that's the way to go: ALSA. If anyone wants to take this further and expand it immensely you can get Cadence and Claudia from the KXStudio repos or their Github and use any kind of ladspa, LV2, VST plugin systemwide. Even Windows VST plugins with the Carla (or any other) host. That's the way I have my SolydK configured. There's even another way (less integral than Cadence) by using jackctrl and a ladish front end. You can also add a plugins host if you want that. It's all in the repos. For ALSA: Yet another way I used before going "Cadenced" is using the quastools. Then you can replace the alsaequal by any other plugin you like. BS2B or whatever. unfortunately I haven't figured the method to implement other plugins with pulseaudio. there's lot of tutorial how to throw those stuff on alsa but so far I haven't seen them on pulseaudio. in my experience playing with global effect sometimes ruin my music so player so on most times I only use the ones not provided by my music player. I don't use any plugin for the system. Sometimes I use some fx chains due to the crap sound most Youtube videos have. Sometimes truly unbearable... So I can filter it a bit... or a lot! (noise, nasty brickwall limiting, proximity effect boominesss, etc...) But never use a plugin in the way for any other thing. In any case, there is also a systemwide equalizer for pulse audio that doesn't drive you crazy with configurations. I have no experience with it since I don't use pulse, but folks say it's easy to get it working. I wasn't sure if telling about this tool since it's not FOSS, but maybe someone is interested. I guess you'd like it, kurotsugi. It needs registration but the basic app is free. This is something I use all the time for professional work or just listening audio from my computer. It's an excellent mastering tool. One of the very best audio tools I've ever faced. This thing lives in my Ladish session launched at boot. It's also ugly as hell, but does a terrific job when dealing with crap audio, as is most of the audio found or streamed from the internet. Absolutely. in fact it's great to prevent ear fatiguing. It has bit of a learning curve for noobs to learn the tools, but it really worths it. Check the Repair tools for starters... and bypass the limiter, clipper and compressors to not blow your headphones. Then start to tweak. One more thing, this kind of complex tools can do as much harm a good. As in most plugins it's a good idea starting checking the included presets and check the settings what the different tools can do. many of them are just terrible and non useable, but good to learn what not to do either. Be always mild with the dynamics (compression, clipping and limiting) if any is used and you'll be good. unfortunately, bs2b is dead. can we run pulse on top of jack so that I could use bs2b? Don't know haw much you are concerned about "bloat" and how much python3 you have onboard if any. I know many people hate it. If you have python3 installed try this. Will solve anything audio. For me it's a must have. Never use pulse, but can be used with pulse too it has their own bridges (sinks). IRCC, there's also bridges for pulse to alsa in the repos. I have no experience with them other than the Cadence built-in. One more thing, and a tip that any sound engineer or audiophile mustn't forget. Our ears always prefer the loudest stuff (unless hurting). They tend to fool us all the time. So for real comparisons bypass the effect, whatever it is, and try to get the same overall levels first, then compare the results. You'll be amazed how many times something that sounds astounding at the very first impression, when properly leveled sounds like crap compared with the original signal. This applies to this tool or anything else, a simpler equalizer or whatever. Boosting frequencies is a partial increase/boost of the signal level so we tend to think it's better when might totally be the opposite if we compare the signals at average levels. Haven't tried it whasoever, but it has a good users feeback. nope...I'm not concerned about that "bloat" stuff. I only want to use bs2b with jack. so far I can use jack and bs2b as pulse's modules but I need to choose one of them. mixing them won't work. add a tutorial how to add equalizer. though...there are too many stuff in CAPS so I haven't tried them all. if you want to try other effect on CAPS, replace "label" with the effect name. 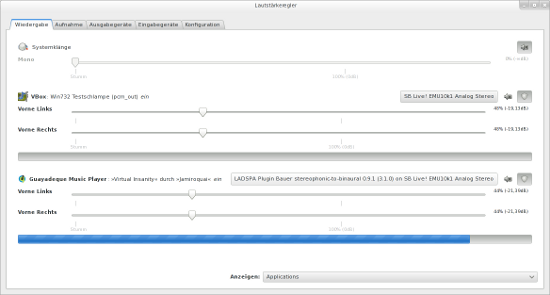 you can find both "label" name and the control parameter using your audio player LADSPA plugin. I'm not sure if all music player have this feature but audacious did.